No one enjoys doing employee performance reviews. They’re often slightly uncomfortable conversations, and even in a best-case scenario, everyone involved feels relieved when they’re done. That isn’t exactly a ringing endorsement for their value, necessity, or how we feel about them. However, they are valuable, they are necessary, and when conducted with a thoughtful process, they can be something you approach with less anxiety. When you can repeat that process effectively with consistent results, you can spend less time planning for reviews, and more time working through them efficiently with the results you want. Why are performance reviews important for marketing managers and teams? What steps should they include and which questions should be asked? How can marketing teams develop a repeatable review process that works? Best of all, this is the actual process the CoSchedule team uses, which has been time-tested and shown to work well. In other words, this post is geared specifically toward what marketing managers need to know most about this topic. 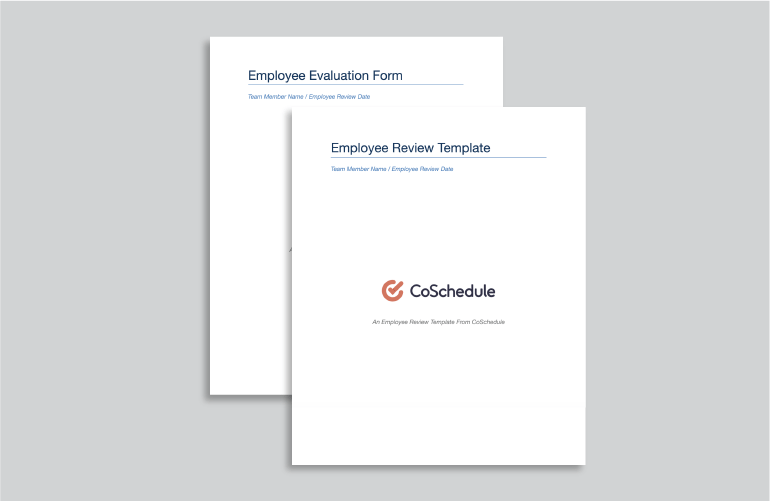 Be a Better Manager With Free Performance Review + Evaluation Form Templates. Employee reviews don’t need to be overly complex. However, you will need to keep documentation of your conversation so you have something to reference in the future, to ensure the important details of the review aren’t forgotten later. You’ll also need to accurately evaluate performance before going into each meeting. Marketing Performance Evaluation Form (Word): Answer six simple questions to gauge performance. 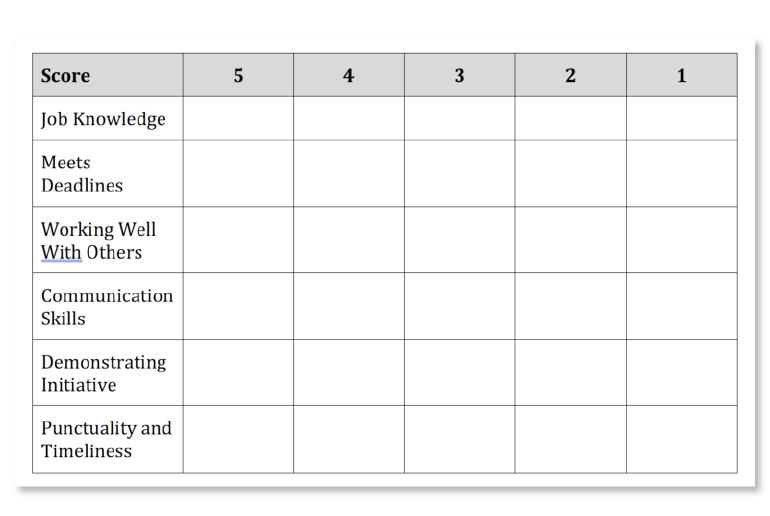 Marketing Employee Performance Review Template (Word): Then, use this sheet to document the meeting. How Can CoSchedule Help Evaluate Team Productivity? 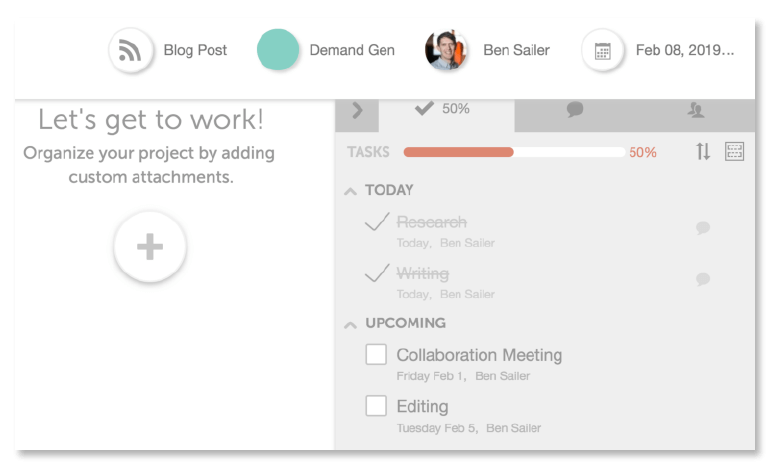 As a marketing project management platform, CoSchedule is purpose-built for managing busy marketing teams. That includes your tasks and workflows for all projects and making sure everyone is getting their stuff done on time. What Exactly is an Employee Performance Review? An employee performance review is an opportunity for team members and managers to assess what’s going well, what isn’t going well, and what’s necessary for future success with a company or organization. It shouldn’t feel like an interrogation. A good review shouldn’t focus solely on negatives. They aren’t one-and-done meetings. Feedback gathered in a review should be considered and implemented throughout the year. This should be a two-way conversation. They aren’t just about assessing the team member’s performance; they’re also an opportunity to get the employee’s take on how they’re doing and how the company is doing, too. What Are the Benefits to Running Employee Reviews for Marketers? First things first, it’s important to understand that these meetings are more than just an annual requirement that you have to fulfill to keep HR happy. Here are a few reasons why they shouldn’t be blown off or phoned in without careful consideration for their purpose. Your team members need an honest assessment of their performance. If they don’t know how they’re doing (positively or negatively) or where they need to improve, they’re unlikely to reach their potential. You need to know what your team members need to succeed. Likewise, you can’t help your team achieve success unless you understand what they need from you. If you don’t set up employees for success, someone else will (when they leave your company). The market for marketing talent is tight. Don’t let people leave because they didn’t feel supported. Who Should Be in an Employee Review Meeting? In most cases, a marketing manager, their supervisor(s), and the employee themselves should be sufficient. If possible, including the CEO too is a good idea (at CoSchedule, CEO Garrett Moon offers direct feedback to each employee in the company during reviews). Then, once the review is completed, human resources will likely need to approve review paperwork (and any pay raises the team member might be due). Work with your HR department if you’re unsure what your internal processes are there. How Often Should Reviews Be Conducted? Here’s a common misconception: staff reviews are a once-a-year deal where you get all your feedback out at once. This could not be more incorrect, but unfortunately, it’s a common attitude (particularly at large companies where one-on-one communication might be challenging to schedule, or just doesn’t happen organically). Weekly syncs: Set up a recurring one-on-one meeting with each team member to check in on how things are going. Quarterly check-ins: Then, schedule quarterly meetings to review how things have gone year-to-date and what’s needed for success over the long term. Annual reviews: Finally, these are holistic performance evaluations that take the entire previous year into consideration. For marketers, ongoing mentorship with leadership is invaluable for development. Also, this post will stress this point multiple times: an annual review should not be the first time an employee hears a given piece of feedback. This is a sign they don’t feel like they can be open and honest with how things are going outside of times allotted for feedback, and that’s corrosive for everyone’s productivity and happiness at work. Weekly meetings: Stick to a set time each week. Quarterly reviews: Stick as closely to a 90-day window as you can. Annual reviews: Same as with quarterly reviews, they should be close to their start date each year. Map these all out in advance so they don’t catch anyone off guard. 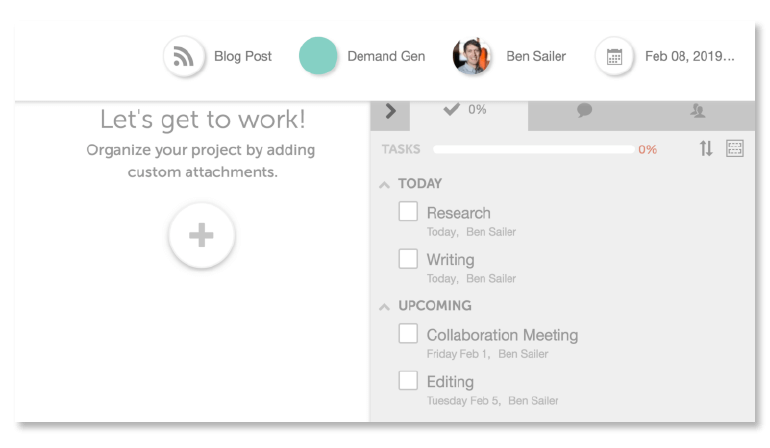 If you’re a CoSchedule customer and use Google Calendar, you can even sync your calendar with CoSchedule with Zapier, so they’ll appear alongside all your other projects. Before heading into a review, you’ll need to know for yourself what you honestly think about each employee’s performance, both in terms of what they’re doing well and where they can improve. It can help to have some sort of checklist to run through when assessing each team member, especially if you have a large team. Does the team member demonstrate high level of job knowledge? Does the team member complete work accurately and on time? Does the team member work well with others? Does the team member communicate effectively? Does the team member demonstrate initiative? Does the team member consistent show up to work on time? Once you’re face-to-face for a review, what should you ask? 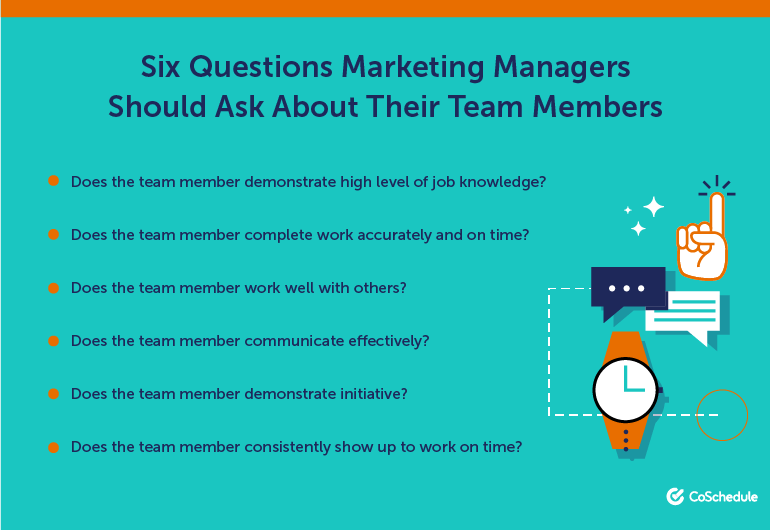 It might be tempting to prepare a detailed list of questions to dig deep into the needs of your team members. That might work. After all, it stands to reason that more granular questions will get more detailed answers, right? Well, you might be able to have a more productive and insightful conversation by keeping your questions simple. What’s going well? This can be an open-ended discussion around what’s going right for the employee, their work, and the company. What isn’t going well? Same as above, but for things that need improvement. What’s needed for a successful future? What should the employee keep doing? What should they change? And likewise, is there anything you or the company may need to consider as well? Generally, it’s best to keep this an open-ended conversation. But, as that conversation moves forward, how do you make sure it stays on track and the words you choose to maintain a productive tone? 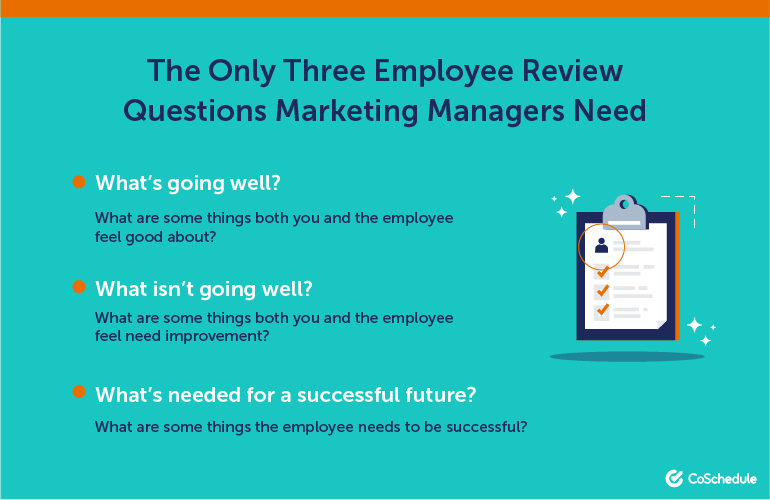 The only three employee review questions #marketing managers need. That’s where this next section comes in. While the discussion will sound awkward if it's overly scripted, there are ways to phrase things that best expresses the point you’re getting at. Here are some suggestions. Is there anything we can do to better support your success? How can we do even better at this? How would you suggest correcting this problem? Are there any lessons you’ve learned from failure this year? If you were to [INSERT MISTAKE] again, is there anything you’d change in your approach? What should we be doing that we aren’t right now? If there was anything you could change right now, what would it be? Where do you want your career to go in the next year? Three years? Five years? Conducting the actual meeting (doing things the CoSchedule way) is a simple process. Once a time has been blocked off on your calendar, you just need to find a quiet place to meet. If you know you’ll need to book a room in your building in advance, consider doing this at the same time you add the meeting to your calendar. This way, you can avoid scrambling at the last minute. Then, consider grabbing your refreshment of choice (if you’re nervous for any reason, you might want to avoid caffeine). From there, keep the following tips in mind. Imagine being dragged into a room to get grilled on every mistake you’ve made over the last 12 months. How do you think you’d respond to such a situation? Even the best of us would likely get defensive and ultimately wonder why none of the errors or slights mentioned were addressed sooner. Furthermore, that would be a one-sided conversation, centering around you and what you offer your company. As a manager, it’s important that you understand exactly what value someone is bringing to the table and making sure they’re carrying their weight. Marketing doesn’t deal in participation trophies; everyone has to be making a meaningful contribution toward raising revenue. But, you also need to understand what value you and your company offer your employee. In an industry where talented professionals can choose to take their skills elsewhere, they choose to work for you. So, treat the review like what it should be: a conversation between professionals. As a manager, you set the tone for the conversation. Keep it professional and ensure negative feedback is measured and constructively framed. This isn’t the first time it’s mentioned in this post. It certainly shouldn’t be the last time you repeat this mantra to yourself. But, here it is again: an annual review should not be the first time and place a team member hears about a problem. If someone isn’t cutting it, address the issue when it arises. And if it’s necessary, you might need to develop some sort of improvement plan, or maybe even let them go (though these are other topics entirely beyond the scope of this post, and we certainly hope you’ll do everything possible to help your team succeed before resorting to parting ways with anyone). Take care of issues when they become issues, not when they become catastrophes later. Which is exactly what the evaluation is going to turn into if you cut corners here. While you’re conducting the review, keep notes about what’s discussed. Record both the team member’s thoughts and your own. 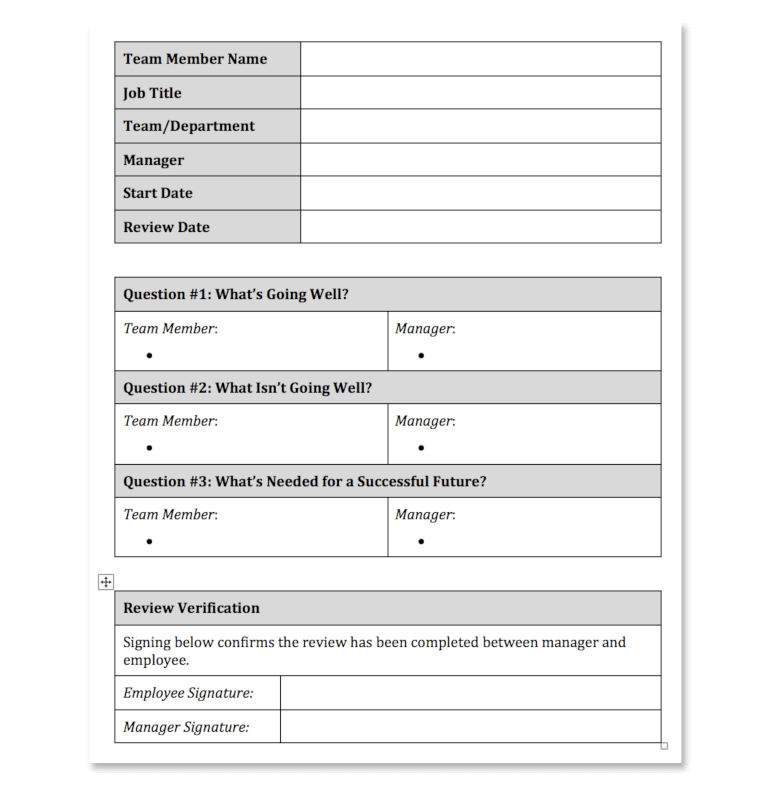 Use the employee review template included in this post (you can take a shortcut to find it here). When evaluating the talent on your team and their actual productivity, it’s nice to have actual data to quantify how well everyone’s doing. That’s where Team Performance Reports in CoSchedule come in. Here’s how they work. Ready to manage your department with one marketing project management platform? Schedule a demo and see firsthand what makes it an industry-favorite solution.